I did too and I think she still is a terrible actress...can't even work up a tear. I wish that people would look at the facts. Johnny has had problems with substance and alcohol abuse. But he has never been accused of spousal/partner abuse. And not just one of his ex partners but all of them defended him. Heard was arrested for abusing her ex girlfriend. She was lucky to escape a custodial sentence. Unfortunately the tabloids refuse to accept not all domestic abusers are male. >Go to Photos, then All Photos. >Scroll pretty far down until you come to a small group pic on the left that includes JD’s right hand and three pics from the kitchen cabinet fiasco. >JD’s right hand shows the eagle and SLIM tattoos. >Tap to enlarge the group. My question is simply: Has this already been addressed somewhere, by someone? Thanks. I knew that video wasn't Johnny!!!! Shoulders are wrong, the walk is wrong, jawline is wrong!!!! AND the right hand with no tattoo is PROOF!!! The apparent lack of tattoos on the hand does not prove anything. The video has clearly been shrunk and then enlarged. This causes any details such as lines to merge with the surrounding area. Notice that the time on the wall clock and the writing on the wine bottle label are also apparently missing. 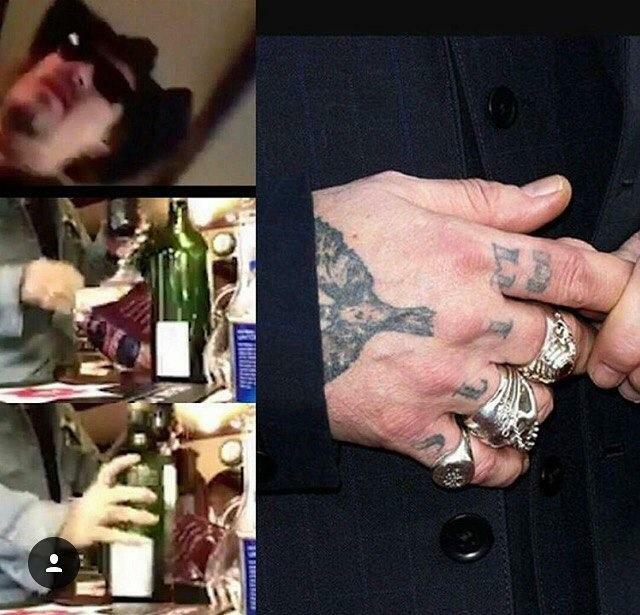 The video in question, blurry, clandestine, shows Depp filling a large beaker with red wine and then grabbing Heard’s phone after seeing she is recording. The video was “leaked” or released by showbiz gossip channel TMZ in the States, although compared to Heard’s other allegations against Depp the video content seems unexceptional or certainly the least disturbing." Edit: Is there anything that proves the facebook is truly Jack Depp's and not an imposter? I read that Johnny got that crow tattoo around 2012 with Damian Echols (correct me if that's wrong). Wasn't it in Spring 2015 that he found out about the misappropriated millions? So is the sound from 2015 and the video from prior to or during 2012? Thinking about what happens when an image is shrunk and then enlarged. For example if it is shrunk so that it is 1/2 height of original and 1/2 width, then half the horizontal pixels and half the vertical pixels will be removed so the effect is 3 out 4 pixels will be removed. In the case of a tattoo on skin or writing on a label, many of the pixels with the tattoo or writing will be lost. If it is then enlarged, the algorithm will attempt to replace the missing pixels by what is either side which is likely to be skin color or white label. The detail of any lines is not in the enlarged image. This effect is even more so with video where movement affects the result. The kitchen video was edited to remove what Heard was saying. It might also have been deliberate to shrink and enlarge to remove detail. Or it might have been low quality video such as if it is was being streamed to somewhere instead of being saved on the phone. I think it was filmed in February 2016 as the clothes are like those worn in the Grammy gift lounge photos. It could be another time as be re-wears but probably not years earlier as that doesn't fit with when he learnt about the money loss. I think the video was reduced to about 20% of it's original size, either for streaming or attaching to an email or to remove detail; then it was edited to remove sound and then enlarged to give to TMZ. Last edited by RumLover on Wed Apr 17, 2019 12:25 am, edited 1 time in total. Ruby Begonia wrote: I read that Johnny got that crow tattoo around 2012 with Damian Echols (correct me if that's wrong). Wasn't it in Spring 2015 that he found out about the misappropriated millions? So is the sound from 2015 and the video from prior to or during 2012? Yes, Johnny got the tattoo with Damien Echols during the 2012 TIFF. Exactly....Jack doesn't have a public IG account so why would he have a facebook page? Gee, I’m sorry beyond words for stirring up so much confusion. I know Lily Rose doesn’t have any public media accounts anymore, but didn’t know anything about Jack. This is awful! Again, very, very sorry to all here who may, like myself, have gotten their hopes up. Sorry...I don't mean any disrespect but I think the person is mistaken. The crow tattoo is there..it's just covered by the sleeve. You can see the tip of it a few times when he extends his arm. Anyway....Today The Blast posted a video from the elevator and if you put it in full screen you can see she has no injury to her face. ForeverYoung wrote: Sorry...I don't mean any disrespect but I think the person is mistaken. The crow tattoo is there..it's just covered by the sleeve. You can see the tip of it a few times when he extends his arm. Infuriating, though, are the rumors that WB is going to fire him from FB3 because of the uproar over his defamation suit and her sensational BS in response. She's the one dishing the ugly, defamatory stuff to the media; he certainly should have the right to defend himself! He kept quiet during WB promotion of Aquaturd; why didn't WB tell her to be quiet for the sake of FBCOG? Why don't the fret about firing her now like Johnny is being threatened. Seriously, this piece of known as Amber Heard and her grifter buddies need to go far, far away. I'm sick about all this.